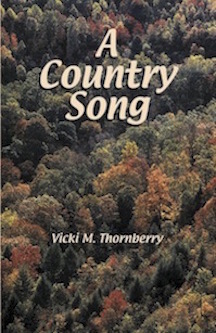 Vicki M. Thornberry’s first book, A Country Song, is poignant, funny, and, at times, excruciatingly heartrending. A former high-school English teacher who has also lived through the School of Hard Knocks, Thornberry has much to say about growing up in Appalachia, alcoholism, the inner-city school environment, and marriage. Splattering bits of her soul on every page, she takes the reader from her youth in the hills of eastern Kentucky to her days of teaching at Campbell County High School and later, her years in Silver Grove and demonstrates that one can overcome a dysfunctional past—adversity only brings understanding and perspective. Thornberry weaves her great love of country music into her story, including references to the songs that fit her life so well. A compassionate survivor of many of life’s most difficult, and common, challenges, she becomes “Every Woman” in this, her own “country song.” One can only hope she will sing another.